DENVER, CO. — Broncos wide receiver, Emmanuel Sanders in conjunction with 104.3 The Fan, Jackson’s and Coors Light, will appear on Monday night Nov. 3rd at Jackson’s Sports Bar at 1520 20th Street (across from Coors Field). Sanders will appear along with Bradley Roby from 7:00-8:00 PM. Pricing to get your item(s) signed by Emmanuel Sanders is $49 any item. Pricing to get your item(s) signed by Bradley Roby is $20 any item. 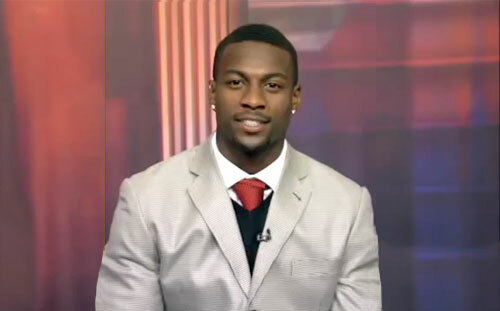 Photo shows Emmanuel Sanders in a 2013 interview speaking about his humble beginnings. According to Autographs.com, at all of the signings you can bring your own item or purchase one of their items for sale at the event. For those unable to attend you can purchase your items in advance and pick it up afterwards or they can ship at the following rates $6 small flats and minis, $11 jerseys and 16×20’s, $17 full size helmets. Watch Emmanuel Sanders speaking about his three-year, $18 million deal with the Broncos. Sanders was drafted by the Pittsburgh Steelers in the 2010 NFL draft. He agreed to sign with the Denver Broncos on March 15, 2014. In his debut as a Bronco, Sanders recorded 6 receptions for 77 yards in 31-24 win over the Colts. He caught his first touchdown pass as a Bronco in a 42-10 win over the 49ers on October 19, 2014, a game that also saw Broncos quarterback Peyton Manning become the all-time leader in career pass TDs. In the Broncos 35-21 win over AFC West rivals San Diego Chargers, Sanders caught 9 passes for 120 yards and 3 touchdowns. Sports Speakers 360 is a booking agent for pro athletes. If you would like to book Emmanuel Sanders for an appearance, contact Emmanuel Sanders’ booking agent for fees at Sports Speakers 360. For booking agent and appearance fee information on how to hire Denver Broncos players for appearances, call 1.855.303.5450.